In a typical online course, students are more likely to interact with course materials — 52 percent of the time — than they are with faculty (23 percent), other students (22 percent) or staff (3 percent). 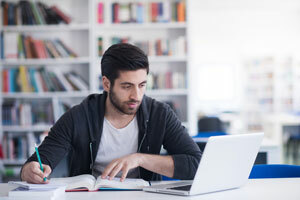 According to a recent survey from Quality Matters and Eduventures Research, the research division of ACT/NRCCUA, time with materials is less prevalent in online classes at regional private colleges (46 percent) compared to four-year publics (53 percent) or community colleges (58 percent). The third annual "Changing Landscape of Online Education " (CHLOE 3) report surveyed 280 chief online officers (COOs) (up from 182 last year) at U.S. colleges and universities about policies, practices and plans around online education. Researchers defined the role of "chief online officer" as having lead or shared responsibility for online faculty training, online instructional design and course development, coordination with academic units, online policy development and quality assurance and overall strategic planning. 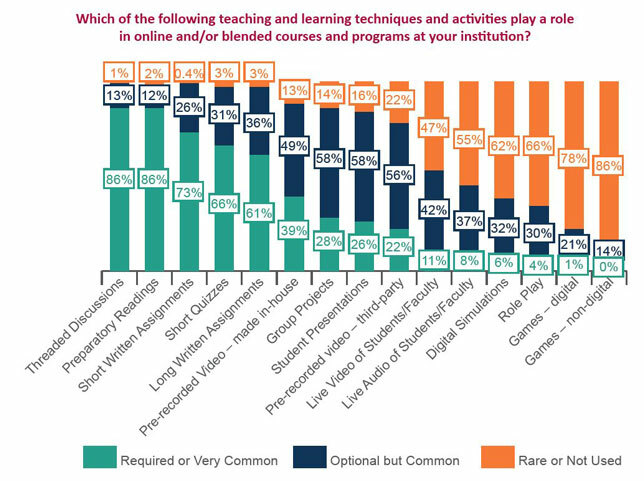 At institutions where faculty members designed online courses on their own, interaction with materials was "unusually high"; and it was lowest at schools following a team-based approach that brings in various experts, such as instructional designers, to design the courses. Pre-recorded videos made in-house (39 percent). And while two techniques — digital simulation and digital games — both "have the potential to transcend in-person norms," the researchers said, they also "remain prohibitively expensive and difficult to scale across an institution." Therefore, they're also the least used techniques; digital games were found in just 1 percent of institutions and digital simulations were found in 6 percent. The survey asked its respondents which of five choices of student engagement were used most often in their fully online programs. Student assignments came out on top. That was followed by two kinds of discussion-board measurements: frequency and quality of participation. Formal course evaluation by students was ranked fourth and instructor evaluations fifth. Most online programs — 84 percent — are delivered primarily in an asynchronous manner. This approach is most pronounced in institutions with a sizable number of fully or partially online students; there, 92 percent of the online programs use async delivery; however, these schools are also more likely to report that their delivery is "wholly" versus "mainly" asynchronous, an indication that larger institutions "are most likely to embody a range of online modalities and approaches," the researchers suggested. About 45 percent of COOs reported that their online courses "required zero face-to-face sessions." Voluntary in-person sessions were common at 18 percent of the schools; and "occasional" visits were required at 14 percent. The remaining 23 percent said practice varied widely by academic department.